The iconic orange that we have gotten so used to will no longer be around as food delivery service provider foodpanda gets a fresh new look. The rebrand follows its acquisition by tech giant Delivery Hero in December 2016, changing its brand colour from orange to pink. While the iconic panda will still remain at the forefront of its logo, it has been tweaked into a rounder and more “modern” version. According to the company, the new logo aims to be more memorable. Also, foodpanda’s font has also been updated to be more contemporary, which is in line with the brand’s new direction. Pink will be a strong differentiator for foodpanda to stand out in markets in which orange is used extensively throughout the cities´ landscapes. Pink is also the signature colour of its sister company foodora. The rebranding will roll out globally in 190 cities across 12 countries, including Singapore, Malaysia, Hong Kong, the Philippines, Taiwan and Thailand. Beside our new brand identity we also offer a new app and front end (which is live today!) with added value for the customers, including an improved user-friendly interface or features such as the live tracking of orders and dynamic delivery times. While foodpanda declined to comment on how much the rebrand cost. Kantor, however, said that converting all its brand assets has been a “mammoth task”. As part of the new look, the company had to work on its app, website and other digital platforms, before moving on to over 1,500 restaurant partners in Singapore to replace all of its orange restaurant collaterals. 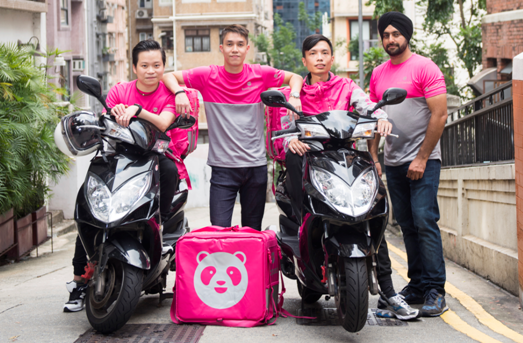 foodpanda also swapped uniforms and delivery bags for its 3,000-strong rider fleet. It also changed everything from orange to pink, including the walls, at its Singapore headquarters. Kantor added that there will not be any key personnel changes. Despite the rebrand, foodpanda will continue with customer-centric, highly localised marketing campaigns and partnerships in Singapore. It is currently working with renowned restaurant brands in Singapore, such as Pizza Express and Kinara, to create new dishes to celebrate its rebranding. The dishes will be sold exclusively on foodpanda for two weeks. As part of its marketing initiatives, it is also hosting a pop up event in November, featuring an innovation lab where five chefs from leading restaurants will draw on unique flavour profiles to create their own food trend. The company will also be running a content campaign with SGAG. In Singapore, foodpanda works with W Communications and Havas Media for ad-hoc out-of-home media buys. Last year, the company reappointed Text100 to manage its communication strategy in Hong Kong. Since Bill Chan’s departure last May, Juggi Ramakrishnan fills his spot at Ogilvy & Mather Beijing. ..